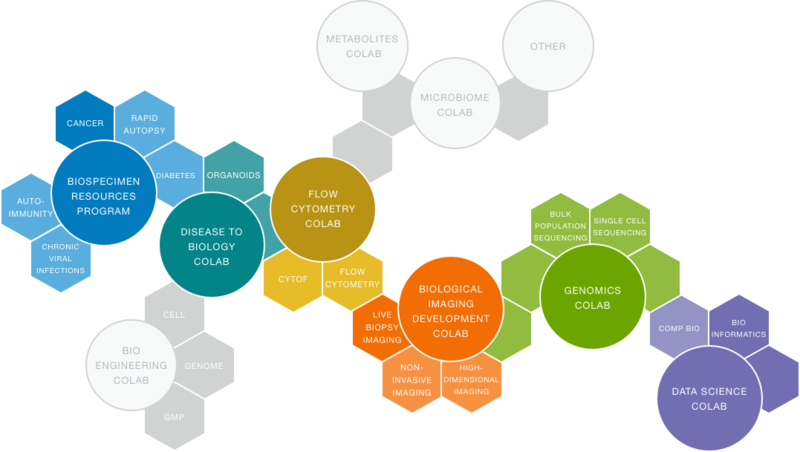 The Bakar ImmunoX Initiative proposes the concept of CoProjects, a series of shared projects designed to integrate our community through common pipelines and data curation. ImmunoX CoProjects aim to build immune profiles for untapped streams of human diseases at UCSF. Each CoProject is investigator-led and takes advantage of world-class staff and technologies in the cutting-edge CoLabs space. Data is curated and stored in a university database and released to the larger UCSF community after a set embargo period. To encourage the sharing of data during the startup period, the Bakar ImmunoX Initiative subsidizes or fully-funds CoProjects. Physician-scientists provide human specimens and enjoy access to a rich and reliable data pipeline without the burden of running their own lab or establishing an expensive and time-consuming sample processing pipeline. Science wins because we’re maximizing our resources: research funds, valuable specimens, and open-access to vast swaths of data across diseases. While CoProjects are investigator-driven, the day-to-day operations must be managed and run through the cutting-edge CoLabs. CoLabs are a collection of integrated laboratories specializing in infrastructure or technologies. It seeks to revitalize the model for core resources by capitalizing on critical personnel and cutting-edge technologies, and driving collaboration across disciplines. The model will house all CoLabs in a contiguous space and create a set of common pipelines and workflows in one centralized locale. It will recruit and retain world-class staff through project engagement, backstopped “tenure,” and annual operational funds. And it will develop and invest in transformative methods and technologies. The Bakar ImmunoX Initiative encourages proposals that establish untapped streams of immune-related disease biopsies or other specimens at UCSF, with the underlying objective to add value to the ImmunoX Data Library.